The Mint Slice is an Australian icon. Y es, perhaps slightly overshadowed by it’s better known Tim Tam brother, but to my mind actually a superior biscuit. 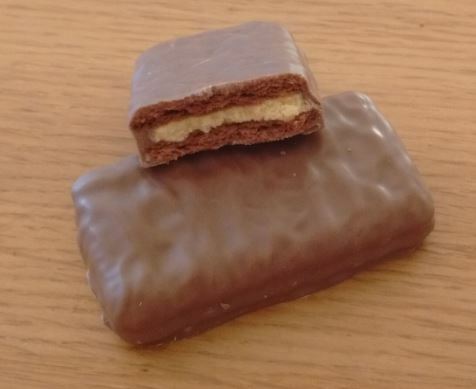 Arnott’s have taken this classic, and ‘twisted’ it, with an oh-so-trendy salted version, replacing the peppermint cream with what appears to be Tim Tam filling, enhanced with the addition of salt. Salt seems to be the magic ingredient being added to all manner of confectionery and cakes at the moment. I suppose that making things even more unhealthy usually enhances the appeal. These biscuits rate a whole ‘0.5 out of 5’ stars on the Health Star Rating, so you know there’re going to be good. And they are good. 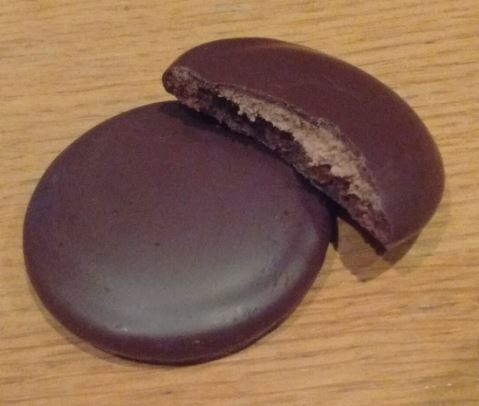 Smooth chocolaty cream, with just a hint of the salt at the end, on that rich biscuit base enrobed with thick dark chocolate. Oh yes, these are at least as addictive as the original. Eating a whole pack of these is waaaay to easy. I’m giving them a nine and a half out of ten. Top stuff, Arnott’s. Yes folks, this is it. The one you have been waiting for. Buckle yourselves in, because we’re going deep into the heart of a great Australian controversy. Just who has the best Ginger Nuts? So let’s get into this. 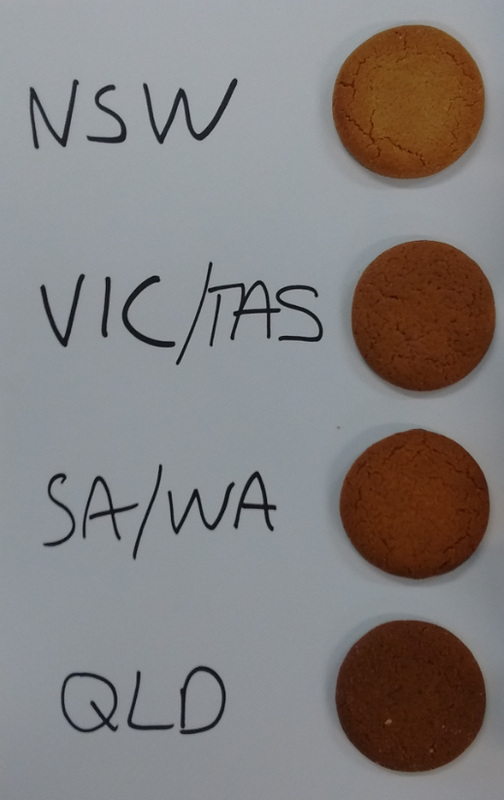 We’ve looked at the NSW Ginger Nut before in some detail, but to help me with this important quest I trawled through my little black book of biscuit fanatics to pull together a small team to help with the tasting – including representatives of each state to ensure a balanced panel. They do actually look quite different – the QLD one is darker, for example, and has sugar glistening on the top. Interestingly they all have exactly the same list of ingredients – but the order of the ingredients is different on each pack. So the recipes are a bit different, it’s not just how long they are baked. 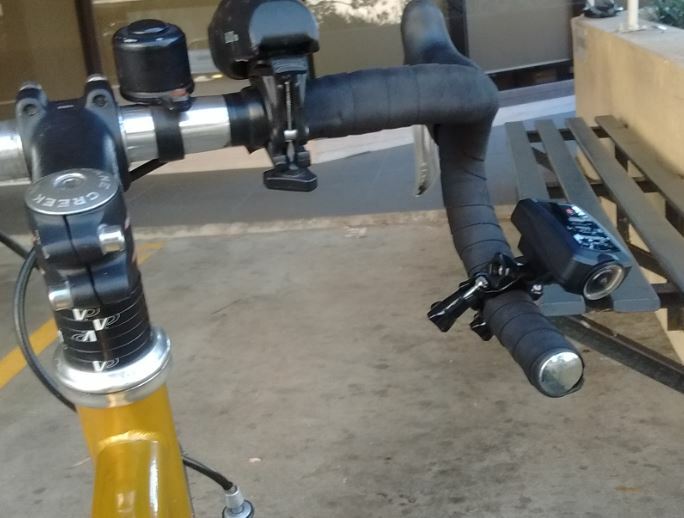 They also have slightly different energy ratings – with the QLD variety having a few more calories than the others. 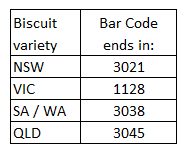 Those on the diet should stick the the NSW ones, which are 5% less calorific than the QLD variety. Yes yes yes, I hear you cry impatiently, that’s all very interesting, but what do they taste like? W ell, they do actually all taste different. The Victorian ones, for example, are more gingery than the others, whilst the QLD ones have more of a gingerbread taste, rather than a ginger biscuit flavour. Less hot, more mellow. And of course, the texture varies quite a lot. The extraordinary hardness of the NSW variety is utterly unmatched by it’s brethren, with the SA/WA version seeming very chewable by comparison. The QLD version is much crumblier, which coupled with the thin biscuit makes them very easy to eat fast. The Victorian version has a nice crunch to it, and texture-wise is probably the closest to the Ginger Nut archetype. Of course, there is another aspect to the Ginger Nut which is very important – that that is its dunkability. 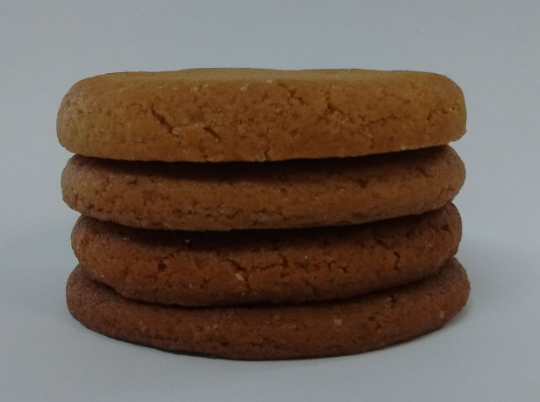 The NSW Ginger Nut, it has been oft observed, meets hot tea like a <insert inappropriate metaphor here>, yielding into soft, chewy goodness (but never crumbling into the tea, heaven forbid!). The Arnott’s flavour innovation machine just keeps cranking ’em out. It seems not a week goes by without yet another Tim Tam variety hitting the shelves. I imagine the overlords in the marketing department standing over the poor cream filings development team, whipping them mercilessly and crying ‘more new flavours, and make them tasty!’, whilst the poor, downtrodden fillings team frantically concoct new flavours whilst dodging the flailing lashes. And having previously created the Pina Colada flavour, it seems they grabbed the pineapple part of this recipe, left out the coconut and then held it up in trembling hands to their masters, whimpering, ‘try this new Pineapple flavour, oh great ones’, in the hope it would appease them and earn a brief respite from the relentless pain. Oh yes, it’s no fun being an Arnott’s cream filling developer. So I eat these in solidarity with those poor folks, but at the same time feel a bit cheated that it’s essentially the same as the Pina Colada without the coconut. Whilst I think is actually less good, as the coconut adds richness. And to be honest I’m still not sold on this whole pineapple / chocolate combo thing. Sorry, this one only gets a two and a half out of ten. But please, Arnott’s, don’t take it out on your poor filings team. I did it. 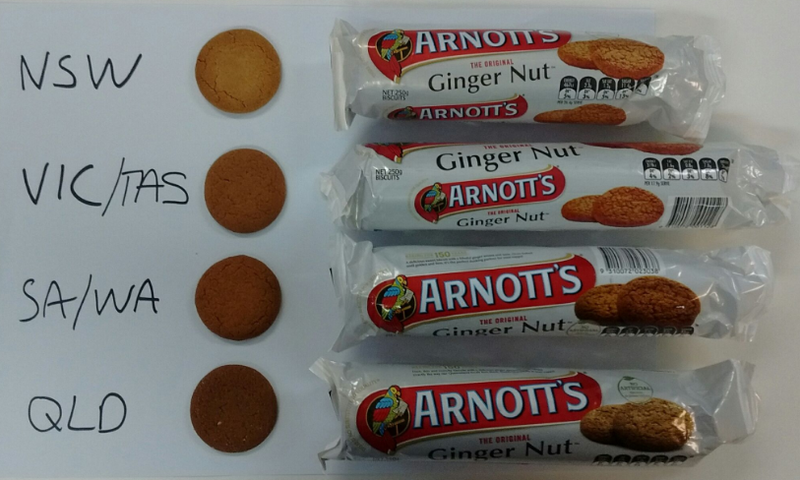 I finally assembled a full set of Arnott’s Ginger Nuts. A life ambition. The full review arrives on the 20th June 2016. 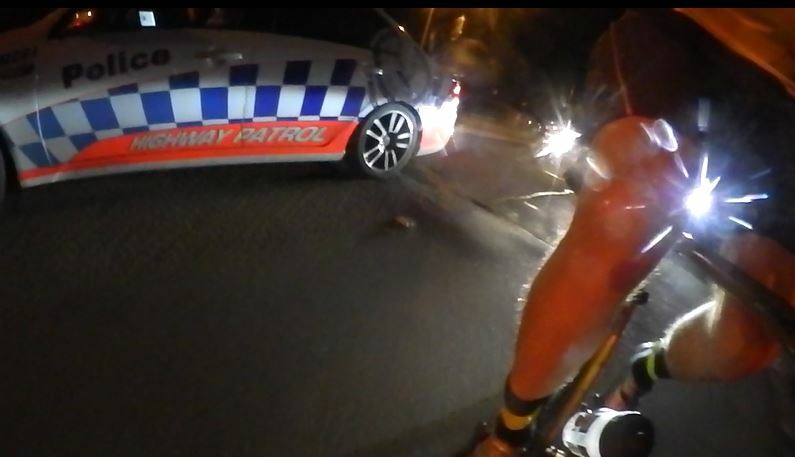 In the meantime, here’s the original 2011 review of the NSW version, and the more recent follow-up. Finally, I get around to writing this one up. 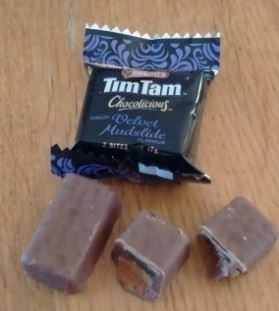 The last in the quartet of new Tim Tam flavours, based on ‘virgin’ cocktails. 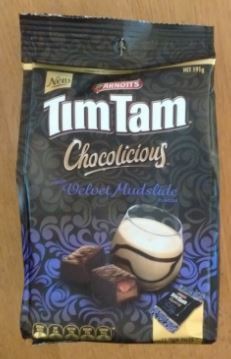 Not an actual Tim Tam, but a variety of the rather good ‘Chocolicious‘ line. When I first reviewed the Chocolicious line, I noted that when you open the packet you get a strong smell of spirits – so I suppose it’s only natural to make use of that in a version inspired by a vodka cocktail. These are good, ladies and gentlemen. Not quite as good as the dark chocolate ones, but pretty close. They are very grown-up and moreish, with a hint of coffee in in the truffle and a rich chocolate flavour. I liked them, and ate most of the packet in one go. I’m going to give them an eight out of ten. Definitely the best of the ‘mocktail’ bunch.